What he says is correct. If you take out Kholi and Pujara you are left with Rahuls and Sharmas. If you take out Azhar Ali and Asad Shariq from Pak you are left with your Hafizs and Sarfarzs. It will take Ind at least another decade to replace someone like Kholi. This however does not take anything away from IND. Clearly you have different definitions for a "road", "lifeless pitch", "curator should be fired" than I do. The likes of Rohit kill teams on actual roads. Someone obviously hasn't paid attention to Rohit's career. As will the likes of Mayank, Shaw, Rahul. 0/10 as far as your attempt here goes. The fact is this is a bad Australian team, you can pretend otherwise and think it's an effort to diminish India's success when in reality it's calling out how poor this Australian team is. Being 90/6 on this pitch is just proof of it, if Smith and Warner were playing, you can bet that the scoreline would be different. That's correct for away matches, but at home India will still boss the game even if you take out Kohli and Pujara. They won't be easy to beat. Aus has put too much faith in experience and left out some younger ones with better prospects due to sandpaper saga. Aus will do fine in future. Cummins dropped by pant off vihari. This team would still beat NZ. Dude at least be original. Nah, that seems very unlikely. We are in a very good position. Rain forecast for two days. Aus needs to kill time. Last edited by Buffet; 28th December 2018 at 07:50. Nah, we'd beat them home and away. Their bowling isn't good enough to cover for their awful batting. They can't even score runs on roads, while we have batsmen who are capable of scoring big in favorable conditions. Last edited by Aman; 28th December 2018 at 07:52. No team is considered poor in their home conditions, when you have an excellent domestic structure like Australia. Indian C team will clean sweep most of the teams in their home conditions. Go to any Aussie space, all they're talking about is their batting, BBL hurting their Test cricket, selectors and shield cricket. Just imagine how good a player pant would be if he worked half as hard on his batting and keeping as he does on his non stop blabbing. Australia are home track bullies par excellence. Pat will deserve a pat on the back if he scores a 50 here. Khwaja and Voges killed your lot on their last tour across the Tasman. Warner is not even a particularly good test batsman in testing conditions. Your bad Australian teams are still superior to your good NZ teams. Last edited by Sin Nombre; 28th December 2018 at 07:57. People like Khawaja and the Marsh twins will score big against NZ. Scores of 500+ were conceded in the last series between these two, 2015. And even with an off colour Warner and Smith, Aus were able to beat NZ easily in NZ earlier that year. Both teams were led by McCullum. Khwaja and Voges killed your lot on their last tour across the Tasman. Aman's bad Australian teams are still superior to your good NZ teams. Voges isn't playing and Khawaja had one golden run where he was scoring runs against most teams. Voges would be the best batsmen in this team. lol.. Even Indian players play T20s. Have you not seen their scrambled techniques. Its just that Indian bowling is superior and that is the difference here. On the contrary, it's you who's suffering from an acute case of indigestion. If India were missing their top two bats, they'd still be rogering teams IN India, the lone exception series against Australia in 2016 notwithstanding. He has batted long time in this series. He can surely bat. Now scoring 50 may be harder, but I will take it if he can kill 25 overs. Voges would be by far the best batsmen in this team. Khawaja during his hot run was scoring runs against SA and everywhere in Aus. Not the same when out of form and there's no pressure with Warner and Smith around. If Smith and Warner were playing, this series would be 2-0 Aus and Aus would probably draw this match to win the series. You can try to deny it, but it's true. Last edited by Aman; 28th December 2018 at 08:00. Why'd one need to go to 'aussie space' whatever the eff that means. Does their rant and whinge carries more weight for an immigrant brownie like you? LMAO! These Marsh brothers are just as bad as the Akmal brothers. Utterly useless cricketers. NZ don't have the bowlers to take 20 wickets on Australian roads. This pair needs to bat and they both have batted together a lot in this series. Khawaja would have piled up the runs if presented a Southern hemisphere attack and a concrete slab. Story of his career. Shaun, Mitch Marsh and Paine would have scored runs also. Put another way, they wouldn't be 115/6 against a 445/7 target at the MCG against NZ - no way. A sandpapered ball might have resulted in Starc bowling some more balls of the century, who knows. It would have been 0-4. Usually true, but not against this batting line up missing their only form/world class batsmen. This team has zero batsmen capable of scoring big runs, and the one player who is, is out of form. I'm usually catious of our chances, but I'd be gutted if we weren't able to beat this Australian team. None of their batsmen are in form, the aggression is gone and they lack quality in the batting department. You expect their bowlers to outscore the batsmen. Last edited by Aman; 28th December 2018 at 08:05. Australians have always been great bats in their home conditions. As successive thrashings suffered by NZ can attest. The series would have been 12-0 for the Aussies. Just need to go an Aussie space and ask. We would have been the first team to be triple innings defeated if the cheating trio were batting. One innings defeat for each of them. No shame losing to team with Smith and Warner. It wasn't to a team featuring the country's worst batting line up like India did in the last Test. You don't even need both of them, one would have been enough for it to 2-0 for Aus. This drop of Cummins by Pant will prove very expensive. Cummins is a ridiculously good batsman for a #8. Will cummins drop hurt India? He bats for long period. That was a sitter. Good enough to fetch themselves a draw in UAE. But UAE is your fortress. 27 runs partnership here. Add another 25. 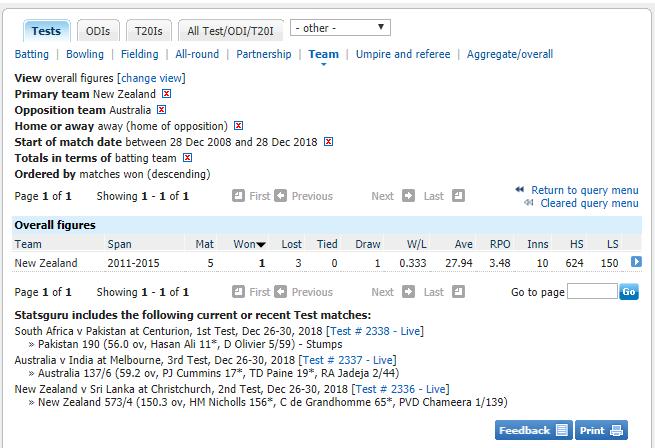 Yes, Smith and Warner are the reason why NZ have won 1 test against Aus, home or away, in the last 25 years. And lost 20. Not all of us tour Australia every 2-3 years. Either way, you have the shame of losing a Test to this sorry bunch. Why wouldn't you play Cummins at 6? He is obviously that good. Patty is going to draw the game here. He can bat for long time, but not really a run maker. You drew a home game against this Lanka. Might end up drawing the series with a captain who is too scared to declare even with a 600 lead. Definitely would be up there in balls faced. He will bring solidity to their middle order by batting time, and prevent the bowling team from getting momentum. That was in PAST.Pak have lost matches and series to SL and NZ in UAE, drawing 1 test against Pak isn't exactly a great achievement. You drew a home game against this Lanka. 5th day was rained out and we managed to win a series in the UAE. What has India down abroad? Lose to England, SA, Aus, NZ while touring most of these countries as often as they do? Look at what Pakistan have managed in their rare tours to these countries. If they played as much as India do, they would have won more matches and would have a couple of series wins by now. Last edited by Aman; 28th December 2018 at 08:20. Yeah, you have only won a solitary test against Australia and lost 37 because of touring every 4 years and not every 2. So you won against the seventh ranked team transitioning after two legends retired? And also famous for collapses. We won against WI which is ranked closely with Pakistan. Also decimated Lanka who you are struggling to defeat at home. Zilch? And they have the best bowling attack in the world. We have Ishant. What a poor batting line up! Australia should be ashamed of fielding this sorry bunch! Keep Indians out for another 40 overs. 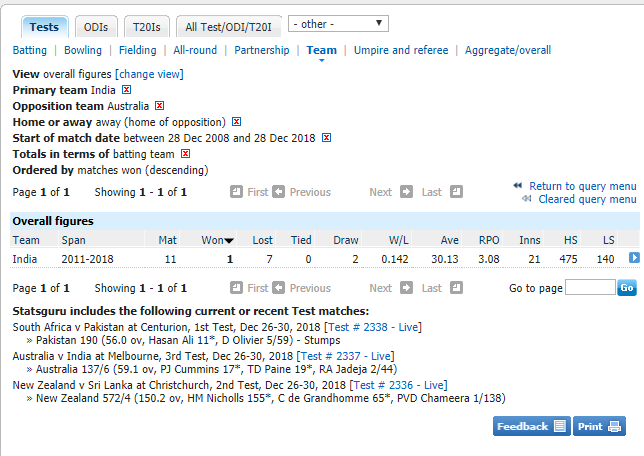 Win more tests in SA and Aus this year than NZ in the last 25 combined ? Congrats on this stellar test record. Only if others could match it. Ishant is better than just about any Pakistani phaast bowler right now. India's sole win in Aus came against a team which was sitting out their only two world class batsmen. Otherwise their W/L would be 0. Last edited by Aman; 28th December 2018 at 08:27. Smith and Warner's ghosts were in each of those games, leave poor NZ alone. India wouldn't have a single win in Aus if Smith and Warner weren't banned. I guarantee no Indian denies the fact that our batting line-up would go to pieces against a dodgy ball. 0-4 would have been inevitable. What? Like getting whitewashed on their last 4 tours and last 2 tours to Australia and South Africa respectively? As a neutral I can say that NZ will thrash both Australia and India home and away at this point. They’re playing too good. Your sole win this decade came against an Australian team sitting out their two best batsmen. Well, no doubt Pakistan are a shitehouse team but Australia were playing without their two best bats, without cummins and hazlewood and lyon. That's half their team missing at a venue where they have traditionally struggled. So yeah, a big enough deal. Like drawing a series in England and pushing a full strength Aussie team close to defeat in a rare series? You tour SA, Aus and England so often yet you've never managed to win a series. Your sole win against Aus this decade came when they were sitting their two best batsmen out. Last edited by Aman; 28th December 2018 at 08:30. New Zealand beating us in India? They will need the ICC to sanction the 'GODMODE' cheat code for that to even be possible. Beloved Pakistan can't even have the better of Khawaja & Marsh and co. in the UAE. India would beat us away, I think we'd beat or draw with them at home. This Aus team is pathetic, me calling them out as such has triggered Indian fans. When did Pakistan push Aussies to defeat? Or is this one of your moral victories? Last edited by BreadPakoda; 28th December 2018 at 08:33. I agree that Aus, SA and Ind should play NZ more often. Yawn. India won a test series in England in 2007. The last time Pakistan won a series in England was in 1996. Try again. Pakistan came close to a famous win almost chasing down 480, then there was the dodgy Sydney Test which they should have won. With the experience India get in these countries, I bet they'd more likely to beat full strength sides than India, who have played mroe than anyone and still not managed to win series. Have no doubt they would have lost 2-0 even then.The only reason they were able to draw a match was coz Yasir was half fit in those matches. Rare series... as in a rare tour for them to Australia.. Moral victory in Adelaide. He is frantically trying to find more. He will have to wait as many years to find one as it takes NZ to beat Australia in even ONE test! At least it was against a close to full strength Aussie team, not a depleted one missing two of their most important players. Last edited by Aman; 28th December 2018 at 08:39. Quite the opposite, they'd have wrecked you 2-0. Probably one win with an innings to spare. Not sure what you're on about, it was yet another whitewash for Pakistan in Australia. Been happening for the better part of 20+ years. Not every pitch that Pakistan loses is 'dodgy'. But can't say the same for the ball - as Smith and Warner were in that team. At least it was against a full strength Aussie team. Wrong. There was no Steve Smith. Unless i'm wrong Pakistan has lost every single test in Australia in the last 20 years. Even Bangladesh would have managed to draw a couple of matches in 2 decades.